By Tom Kertscher on Friday, September 21st, 2018 at 5:32 p.m.
Two promises made by Gov. Scott Walker during his 2014 re-election campaign were promises not to do something. Now that Walker’s second term is approaching its end, let’s see if he’s not done what he said he wouldn’t do. We’ll turn to our Walk-O-Meter, which tracks the Republican governor’s campaign promises. The promises were: 1) Not to pursue toll roads and 2) Not support an increase in the state sales tax. 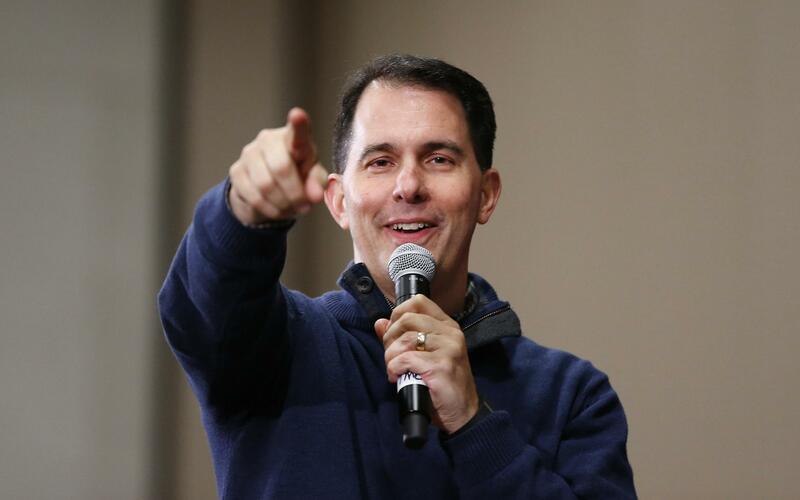 Walker promised not to pursue toll roads, saying they weren’t on his agenda. But less than two weeks after Walker defeated Mary Burke in 2014 to win his second term, there was news that his transportation secretary had asked for money to hire a consultant to study the feasibility of tolling Wisconsin's highways and bridges, with a report due in late 2016. That led us to rate Walker’s promise as Stalled, given that doing the study was a step toward pursuing tolling. The study, which cost nearly $1 million and was done as part of the 2015-’17 state budget, was produced in December 2016. It found the state could take in hundreds of millions of dollars a year from tolling drivers on Wisconsin interstates, but that state officials would face difficulties getting federal approval and raising the money necessary to launch such tolling. Walker’s spokesman said at the time the report would help guide officials as they consider their options. So, what’s happened since then? May 2017: Walker signaled he’s open to charging tolls on Wisconsin’s interstates, saying a tolling plan "would be something we’d look at" — but "it would have to include a reduction in the gas tax for Wisconsin residents." June 2017: Walker laid out a framework for accepting tolling, saying any plan would have to bring in money from out-of-state drivers and then use that money to lower gas taxes for state residents. He said he had privately told lawmakers he could accept tolling if it were "limited to access points on the state line, particularly for example on the Illinois state line" where tolls are already collected across the border. "If (Wisconsin drivers) saw some relief and the people coming out of Chicago or Rockford or elsewhere helped where they're used to that — again I'm not promoting that — but that's something we could live with," Walker said. September 2017: Walker vetoed out of the 2017-’19 state budget a $2.5 million contract to study tolling, saying the state Department of Transportation could study tolling without hiring a firm to do it. In issuing the veto, he said he was directing the department to review whether there was a need for further study of tolling. February 2018: Top state lawmakers said Wisconsin should put tolls on state highways and use the money to draw more federal dollars through President Donald Trump's proposed infrastructure plan. But within hours, Walker cast doubts on the idea, saying he wouldn't necessarily back it and would only do so if taxes were cut by an equal or greater amount. He said: "To be perfectly clear, I am not in any way suggesting support for tolling today. I am not taking it off the table permanently, but I want to make it clear just because someone brought it up doesn’t mean I’m proposing it." Walker promised not to pursue toll roads. But the 2015-’17 state budget included nearly $1 million to study the feasibility of toll roads — certainly a first step toward making the pursuit of tolling possible. On the other hand, unlike some Republican lawmakers, Walker has not pushed for the state to do tolling. And he has said he would support tolling only under certain conditions. We rate this promise a Compromise. Walker also pledged during his 2014 campaign not to support an increaes in the sales tax, which has 5 percent since 1982 — though he did float some possibilities. In December 2013, Walker said he was "envious" of states that had eliminated income taxes and that he could support raising the state’s sales tax rate, or eliminating sales tax exemptions, if Wisconsin eliminated its income taxes. But nothing further developed. And in October 2014, Walker floated the idea of scrapping the gas tax and replacing it with a sales tax on gas. But he said he would make it part of an overall net cut in state taxes. To replace the nearly 33-cent-per-gallon gas tax would have meant creating a sales tax on fuel beyond the current 5 percent state tax on other items; or keeping some part of the gas tax and then adding the new fuel sales tax on top of that. In any case, Walker made the stronger pledge and no increase in the sales tax was pursued. In July 2018, Walker said his administration would begin collecting online sales taxes in October 2018. That was made possible by a June 2018 ruling by the U.S. Supreme Court that said states could collect taxes for online sales far more broadly than before. It’s estimated that will bring in $90 million in the first year. But Walker has said that whatever the amount, income tax rates would be reduced so that there is not net increase in tax revenue to the state. In any case, this is not increasing the sales tax rate itself. It’s also worth noting that under Walker, state budgets have approved allowing several communities to utilize the premier resort area tax. But that is a local retail sales tax, not a state sales tax. Walker promised not to support an increase in the state sales tax. He has floated ideas about an increase if, for example, the state income tax were eliminated. But there has been no proposal, by him or others, to raise the tax. We rate this a Promise Kept.